"Second star to the right and straight on 'til morning." Every seven year-old knows an important secret: life is lived for exploration, for grand adventure beyond the folds of the imagination. As a child, Dave Williams had lofty dreams that stretched to the moon and back. Reading books and learning about the nascent international space program led the young Dave, by age seven, to know he wanted to be an astronaut someday. Though children often wish upon the stars, many grow into adults and forget the enchanted explorations of their youth. They forget the power of their dreams. But even as an adult Williams never stopped dreaming. He never stopped reaching for the stars. He became a Canadian hero when in 1992 he joined the Canadian Astronaut Program, and in 1995 he became an Astronaut at NASA. He journeyed on two spaceflights and set a record of three spacewalks. How did Williams make his dreams a reality? To find out, Library and Archives Canada, the Ottawa Public Library, and the Ottawa International Writers Festival jointly hosted Dave Williams for public event. Gathering a large audience filled with starry-eyed children at Library and Archives Canada, Williams spoke about his journey to the stars. Charting a path wasn’t easy. Williams chose the title Defying Limits for his book because of the many challenges he faced. 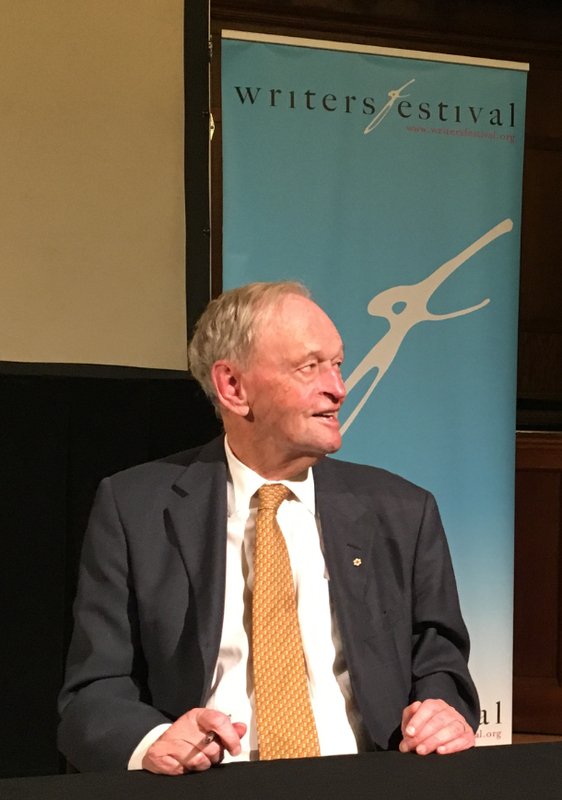 The first was when Williams wanted to become an astronaut as a child; his teacher said it was impossible for there was no Canadian Space program at the time. So, Williams decided to take up the next best thing, and learned to scuba dive at age 12. Williams later struggled with university while managing part-time jobs to cover costs of tuition. He didn’t get into medical school the first time he applied, so he applied a second time. Courage, as Williams told his audience, includes the bravery to embrace your failures. Brave people will allow themselves to fail again and again. Sometime, what it takes to move through obstacles is a shift in perspective. When Williams first experienced failure, it hit him hard. Initially, he confessed, he felt badly about his grades in school. Later, he took ownership of the problem and realized his actions had a role to play in his success. Williams studied at the campus library until midnight and ended up graduating from McGill University with top awards. Then, at the zenith of his career, at age 50, Williams was hit with another big roadblock when he was diagnosed with cancer. Williams admits his first thought after the diagnosis was: I’m going to die. Then a shift happened. His next thought was: What can I do? Williams engaged with his illness, became proactive in his recovery, and at age 54, he flew into space as a cancer survivor. Admittedly, Williams is a Type-A personality. He has big dreams but also does whatever it takes to deliver. One of the most important life lessons Williams learned was from his son, who taught him that sometimes the best goal is not to set any goals. Sometimes, Williams told the audience, the best goal in life is simply to have fun. “Cosmic time is infinite. . . My life is a speck of sand on the infinite beach of time,” Williams observed. “We should not live to leave a legacy, but instead live our legacy,” enjoying life with the ones we love. Books and Biryani’s Dislocation: Finding Ourselves Again event was an intimate exchange of culture, connection and community. Organized by the Ottawa chapter of the Canadian Council of Muslin Women, the event welcomed attendees in from the freezing cold weather to a warm meal of biryani (a melange of eastern spices, rice and meat) and an atmosphere of lively conversation. Over the course of two hours, CBC host Adrian Harewood invited attendees into a humorous and heartfelt discussion with author Djamila Ibrahim on her recently released short story collection, Things are Good Now. Their discussion focused on the role of diversity in literature, as well as the power of stories in creating connections and fostering community. Opening the conversation, Harewood first set out to explore Ibrahim’s motivation and intention as a writer. Having been interested in reading and writing from an early age, Ibrahim relayed the challenge of consistently trying to identifying herself within the books she read. For Ibrahim, writing provides a platform to give profile to diverse voices and create stories that reflect the experiences of people from different ethnic communities and backgrounds. Ibrahim’s stories create places where readers can see themselves, relate to the experiences of the characters, or facilitate a sense of connection an understanding. The importance of being recognized, and of having access to stories and having one’s own stories known, was a timely aspect of Harewood and Ibrahim’s conversation. Ibrahim and Harewood also explored the concept of connection. Ibrahim spoke about the transcendental nature of stories in engaging and connecting people from different backgrounds, experiences and cultures. Literature can serve as tool for transmitting understanding, she asserted. Indeed, as Ibrahim, explained, the title Things are Good Now is a reflection of the complicated feelings associated with her arrival in Canada. For Ibrahim, there was an immediate sense of relief upon emigration. Her feeling of relief was later tempered by the challenge of creating new ties, and as well as a recognition of the permanent separation from her Ethiopian origins. The evening also explored Ibrahim’s writing process. Her ideas for writing stem from her own curiosity, as well as the stories and experiences of those around her, Ibrahim told Harewood. Ibrahim enriches the content of her narratives through extensive research, then often interweaves her research with her own experience. Leading the audience behind the curtain of Ibrahim’s creative process, she helped her listeners understand how she shapes her characters, as well as the feelings and goals which drive their actions. Books and Biryani is an annual salon, and this year’s edition allowed for a candid and immersive discussion on how the cultural themes of Ibrahim’s writing can transcend and impact Canadian society. The conversation between Harewood and Ibrahim also illuminated how writing can be tool for empowering people who are unseen in the current literary landscape, as well as engaging and connecting us all. Canada is not impervious to the cultural and ethnic tensions that are emerging globally. However, this discussion and its engaged audience made me feel optimistic that a diverse group of individuals from across the Ottawa community can come together and connect over literature. 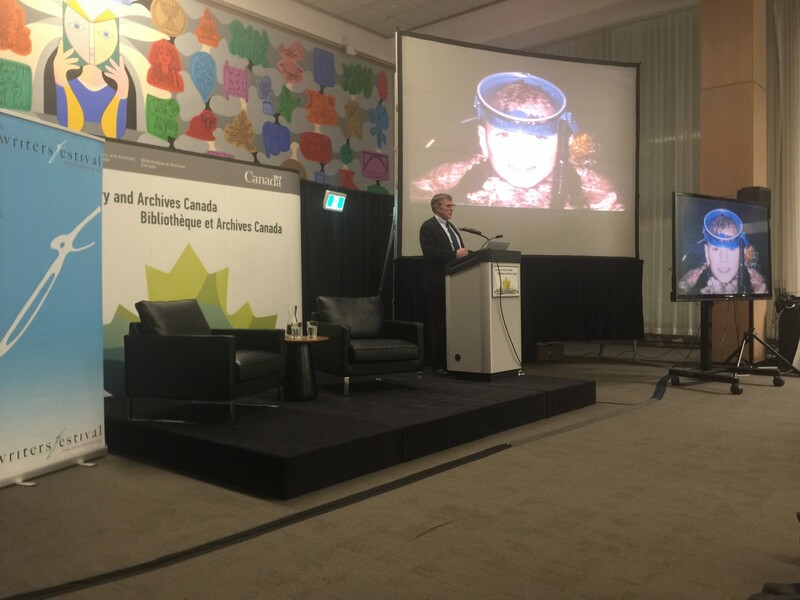 It was evident that Ottawans can pursue constructive discussions on how we as society can continue to grow. This was my first “Books and Biryani” event, but I would recommend it for festivalgoers who are interested in having intimate and engaging discussions that promote self-reflection and consideration of the world. Editor's note: this is the second installment of a two-part interview. For the first part of the interview, click here. JN: So after the tour, will you start writing again? IR: No, probably not, for various reasons. Number one, I’m on a one-book-every-two-years contract, so I don’t need to deliver a book next year at all. And we’re off to downsizing. We’re moving from a big house to a small apartment. So I’ve got a lot of work to do to get rid of stuff. I’ve got to get my head around that, get the house sold, move into the apartment, and then maybe—I mean, I usually write my books the first half of the year. Take this new book [In a House of Lies]: in January I had nothing. I got an idea for it in January, started writing it in February, it was delivered in June and it published in October. JN: What kind of workdays does that make for you? IR: Twelve-hour days, seven days a week. [But] you know, when your story starts flying you’ve got to stick with it. But next year could be different. The first half of the year could be me selling the house and moving into an apartment. So I might not start writing until June [or] July, and two things could happen there: one, I write the next book very quickly and it’s delivered by the end of the year, or I take my time, and I’ve got a year to write the book instead of six months. I don’t know which would be better for me. We’ll see. JN: Both your sons are young men now. Has either shown an interest in writing as a career? IR: No. In fact, Jack has just successfully read one of my novels, at the age of twenty-six. He tried as a teenager and didn’t get on with it, [then] he read my graphic novel a few years ago and said, “It’s ok, dad, but don’t give up the day job.” And now he’s read Strip Jack, which is actually named after him, and I think he quite enjoyed it. But he’s not a crime fiction reader. [These days] young people mostly aren’t. It’s a weird thing, but crime fiction, you mostly get into it late in life. You know what I mean? It’s a genre, a way of looking at the world you only get into when you get some experience. JN: Coming back to your novels, the relationship between Rebus and Cafferty is one of the great Faustian relationships in literature. And they’re both getting older, and they’re both finding themselves, especially Cafferty in recent years, in some bit of peril. Do you anticipate possibly weaving into that [narrative] a sort of joint intimacy, in the sense that Rebus might, for example, find himself in jeopardy and Cafferty might come to his aid, even in a deadly way? IR: Well, they’ve both [already] done it. I forget which book it is, but in one of the Rebus novels Cafferty pulls Rebus out of a nightclub fire and saves his life. And in fact in what was meant to be the final Rebus book, Exit Music, Cafferty is in hospital and he flatlines, and Rebus tries to save him. So that’s been done. You know, I’ve never had a plan for their relationship. I start writing a book and I go, “Where are they now, what are they doing? Do they still hate each other? Are they friends? Are they foes?” It’s a mixture. I mean, every cop needs their Moriarty figure, and I don’t think either one of them can imagine a world without the other. They enjoy the sparring, they enjoy the jousting…the games of chess and mind games that they play with each other. And also now, we see them in their mid-to-late sixties, lookin’ around at a changing world that doesn’t make sense to them any more. Modern technology doesn’t make sense to them any more, and by this stage in their lives they are supposed to be retired and shuffled off the stage, and they just refuse to do it. So there’s an extraordinary empathy between them, but possible not quite friendship. JN: We had lots more to discuss, but we were well past our allotted our time together, so I thanked Ian for making space in his already-crowded schedule. He needed a bit of down time, and I was looking forward to his talk at Christ Church Cathedral that evening, and even more, to our getting together once again, this time for a promised pint at a certain bar in Edinburgh. Jim Napier: So how does it feel to be an overnight success? Ian Rankin: Yeah, right! You know what? I think if you work for it, it feels all the sweeter. There were a lot of times in my career when the books weren’t selling, and the publishers were getting ready to drop me because they weren’t making any money. I was doubting my own abilities, my wife was going to get a job, and we couldn’t survive from writing. You know what it did? It just galvanized me and made me work all the harder. Because it was the only thing I knew how to do, write books. But it’s been a slow build from my first Rebus novel [that] sold I think maybe five hundred copies, and the next one something like a thousand. I kept getting great reviews, so the media were on board, and I got [some] prizes, and eventually it all came good. But it took a long time. The first book was published when I was twenty-five or six, the first Rebus book was published when I was twenty-seven, [and] I was in my forties before I was making a living. JN: We first met in 1997, when you took home the Crime Writers’ Association Gold Dagger for Black and Blue, and it seemed to me that you were well on your way at that point. IR: Not really. You know, people get this feeling that because you’re winning prizes and stuff that you must be making a lot of money, but Black and Blue didn’t hit the top ten in the UK or anywhere else. It was never a best seller. The one after that, The Hanging Garden, had one week at number ten in the UK, and still wasn’t a best seller anywhere else. I think the book after that [Dead Souls] possibly went on to number one. So [I wrote] like ten Rebus novels before I was hitting the number one slot. JN: What made you pick crime fiction as a genre? IR: I don’t think I did. ; I think crime fiction picked me. I was trying to write about Edinburgh. It’s got quite a dark history. A lot of gothic fiction has been set there, or written by Edinburgh authors. Robert Louis Stevenson’s Jekyll and Hyde, and James Hogg’s Memoirs and Confessions of a Justified Sinner, which as far as I know is the first serial killer novel in history, about a religious zealot who starts killing people who don’t agree with his religion. JN: Was this basis for Bible John? IR: Well, maybe. Who knows if Bible John actually existed? There’s some controversy these days about that. But I like to write about Edinburgh, I like to write about Scotland, I like to write about social issues [and] I found that crime fiction is a good way of doing it. [At that point] I hadn’t actually written a crime novel. The first Rebus novel, Knots and Crosses, was meant to be Jekyll and Hyde updated, but nobody realized that. As far as they were concerned it was a crime novel. You know, I hadn’t read [any] crime fiction. I was a Ph.D. student doing Scottish literature. I was going to be a professor of English. I didn’t want to be a crime writer! JN: I think most Rebus fans are happy you didn’t stick with that plan! If I had to guess, I’d say you don’t really buy into the distinction between literary and genre fiction. IR: I really don’t. And specifically, these days I think a lot of younger writers are writing genre who a generation ago would have wanted to be “literary novelists,” and they don’t see a distinction. JN: Is that more more true over on your side of the water than here? IR: I dunno. I think the UK and the States, and maybe Canada, were slow to pick up on the fact that commercial fiction could also be quality fiction. Whereas in other countries like France, for example, they always took the crime novel seriously. They saw it as being an extension of the existential novel. These detectives, these loner maverick detectives, were existential heroes, making their own rules and living [by them]. In the UK and in America, not so much. [But] I think the change is definitely happening, and now in the UK, you can study crime fiction in creative writing classes at university, and in high schools in Scotland you can study my books. So crime fiction is starting to be taken seriously. JN: Between the writing and the book tours, you have a very busy schedule. Are you able to carve out some quality family time these days? IR: At the moment, no. The big UK tour (for In a House of Lies, which will be released in Canada next month) means I got home Saturday morning…and came to Canada Monday morning. So I had basically under two days at home with the family. I’m out here for a week, I go back and I get maybe ten days and then I’m back on the road again. The UK tour starts again, and takes me through until Christmas, I get Christmas and New Year off, and then I go to the States January and February. So I cannae start to see daylight again until mid-February. As testament to his popularity, Rick Mercer’s “Final Report” at the Writers Festival had to be moved from a downtown venue to the much larger Centrepointe Theatre. Nearly 1,000 fans showed up to hear their favourite television comic perform in front of a live audience. Host Alan Neal of the CBC created a warm, relaxed atmosphere, but the evening had the pacing of a stand-up show. Mercer keeping the rapt audience laughing through most of the evening. As Neal explained, Rick Mercer – Final Report is a collection of the best rants from the fifteen-year run of the Rick Mercer Report. The book is also interspersed with behind the scenes memories and an homage to the show’s crew and production staff. Listening Mercer’s stories from the road, it was easy to understand how Mercer would build camaraderie among the entire Final Report team. In taking his readers and the OIWF audience behind the scenes of The Rick Mercer Report, Mercer shared some of the challenges which occurred while filming in more than five hundred different locations. Mercer is a public figure with a very private life. As he told his audience, he has sometimes found it intrusive when he has been asked to describe his home, or the model of the car he drives. However, Mercer eventually opened up aspects of his private life for discussion. Mercer discussed the process of making his own sexuality more public with a rant focussed on the 2011 suicide of Ottawa teenager Jamie Hubley. Mercer also expressed his own sense of responsibility to be a role model along with other gay adults in public life. Mercer is nothing if not fair, indulging as Neal pointed out in “equal opportunity skewering,” which includes easily laughing at himself. He shared a hysterical story of a conversation with director Norman Jewison, in which Mercer somehow sent a compromising photo of himself to his mother, rather than to Jewison. Mercer’s comic delivery and timing was perfect throughout the performance. Reading the rants and the stories in Final Report, it would be hard not to have his voice in your head. Mercer told the audience that his reason for bringing the Rick Mercer Report to an end was based on his desire to protect the legacy of the show. Clearly, Final Report is part of that legacy. Mercer’s pride in the Report was evident throughout his performance, especially regarding the Report’s character as one of the last real ‘family shows’ on network television. Mercer had made the decision after the first season when letters were received from parents that nothing should be included in the show that couldn’t be watched by a family with children. It was in this first season, however, that Canadians saw Pierre Berton roll a joint on national television, a story that Mercer told over continuous laughter from the audience. While the overall tenor of the evening was laughter, Mercer shared several important messages, including a plea to the audience, as consumers of media not to settle for brief stories on Snapchat. Mercer reminded the audience to seek out more in-depth news stories, underlining that anything that happens in the US could happen here. “Anyone thinks otherwise is wrong,” he warned. Mercer’s cautionary message made for a sobering end to a hugely successful evening. The perfect blend of seriousness and humour in his last statement captured the essence of Rick Mercer, His show will be missed, but the spirit of the Final Report will last a long time. Moderated by Susan Birkwood of Carleton University, True North was a Sunday evening discussion with two Indigenous authors: Waubgeshig Rice and Eden Robinson. Coincidentally, CBC broadcasts two podcasts, Unreserved and Reclaimed, both of which feature Indigenous voices and emerging music, on Sunday evenings. I listened to both as I drove home. A quick listen to each show reveals the depth and breadth of talent in Canada’s Indigenous communities, as well as passion, humour, and verve. I hope Sunday night does not become an Indigenous programming ghetto. The sold-out crowd which responded gleefully to Rice and Robinson’s banter and reflection indicated that a wide audience for such programming certainly exists. Waubgeshig Rice, a writer and CBC journalist from the Wasauksing First Nation, opened with a reading from his new novel Moon of Crusted Snow. The novel is a post-apocalyptic tale about a prolonged power outage at a northern reserve. The narrative includes the appearance of an unwelcome white guest who seeks refuge from conditions further south. In the passage Rice read aloud, an elder reflects that there is no word for “apocalypse” in Ojibway. The elder describes the Ojibway world ending over and over – first through being people forced off the land, then through losing their children to residential schools. “We’ve been through ‘apocalypse’ after ‘apocalypse,’ but we survive,” the elder observes. Eden Robinson, who is a member of the Haisla and Heiltsuk First Nations, has won multiple awards for her writing, including a place on the short-list for the Giller prize. Her reading pulled the audience from an atmospheric Northern scene right into the heart of everyday life: a teenage boy dreaming of his girlfriend smoking joints, dying her hair, looking at her phone. It’s a loving scene of normalcy. Trickster Drift, however, is a story of the supernatural infusing life – the boy, Jared, is stalked by his witch mother’s psychotic ex-husband, and is confronted by the supernatural everywhere he turns. As the son of the Trickster, he must come to terms with his true nature to address the forces at work in his life. Moderator Susan Birkwood began the evening by asking Waubgeshig Rice about his book tour. Rice shifted uncomfortably and said touring was, “You know, fine. A bit of a grind.” He paused, then continued, “But it can be fun - a fun grind.” Eden Robinson cut through the tension with a cackle and a waggle of her eyebrows. “A ‘fun grind,’ eh? ?” The audience joined in her laughter and Birkwood scrambled to bring the talk back on track. Though Eden Robinson has written pieces with more specifically political messages – one of her short stories imagines a more extreme Indian Act with violent consequences – she would not let the night be dominated entirely by serious subjects. Bubbling with ribald jokes, Robinson peopled her reflections with loving and hilarious stories of her extended family. Her works are a maniacal mish-mash of worlds. In many of Rice’s stories, the supernatural world reflects indigenous mythology as well as science fiction. Jared is the son of a witch and the Haisla Trickster, while later in the book a ghost in a bathrobe appears and introduces himself as Arthur Dent, the main character from The Hitchhiker’s Guide to the Galaxy. Birkwood wondered if Robinson’s Dr. Who references were intended to invite comparison with Indigenous mythology – a 900-year-old time lord is nothing in an indigenous timeline! Robinson laughed, however, and said that she included them “more for my amusement” than for any specific purpose. The evening allowed festival-goers to experience two delightfully different authors and works conveying varying aspects of the Indigenous experience, from a northern reservation community to an Indigenous boy finding his way alone in Vancouver. Themes of colonialism, Indigenous identity, and intergenerational trauma emerge organically in distinct stories and characters. Listening to more Indigenous artistic expression on the way home, I reflected on how the large the space is for Indigenous art, the more varied, nuanced and individual voices can be shared - and the richer Canada’s cultural world is for it. If you, too, feel horrified at this techno-dystopian vision then you’ll feel glad of the alternatives discussed by authors Nancy Steinhauer and Kelly Gallagher-Mackay in their new book Pushing the Limits: How Schools Can Prepare Our Children Today. Both authors appeared on stage Saturday evening with adept moderator Julie Garlen, associate professor and co-director of Child Studies at Carleton University. Together, Steinhauer and Kelly Gallagher-Mackay explored crucial questions being increasingly asked by the Canadian public. In a world of rapidly changing technological, economic, and social conditions, how do we prepare children for the future ahead? More to the point, how can we equip people for challenges we can’t even imagine? In confronting these questions, both authors are armed with a wealth of knowledge and experience. Nancy Steinhauer has worked for the Ontario Ministry of Education; she also received Canada’s Outstanding Principals Award. Co-author Kelly Gallagher-Mackay is a lawyer who also holds Ph.D. in Education Policy. Together, Steinhauer and Gallagher-Mackay wrote Pushing the Limits as a way of addressing the deep public hunger to understand how schools can ready us for life in the 21st century. Their book is a timely call to find answers that are badly needed. Our nation is riddled with social problems, not the least of them being unemployable graduates. It is past time to ask “what are schools doing?” We can of course expect the usual stock answers, such as "Preparing children for life.” But these slogans are now offered meekly, as if in fear that the listener may laugh. As with all our institutions, political, judicial, and medical, education must be based on first principles. Schools are a profound moral imperative, as their only legitimate purpose is to create human welfare. Now, we must stop to ask if schools are really maximizing human welfare through reading, writing, and arithmetic. Here, Kelly Gallagher-Mackay assured the audience that she is not opposed to reading and writing, only the idea that these traditional endeavors should be the sole goals of public education. Gallagher-Mackay continued by pointing out that many of our provincial curricula were first articulated over a century ago. Back when Canadian public schools were first formed, our society was just stepping out from the Victorian age, and women were not allowed so much as a vote. Safe to say the era held an limited view of what it means to be human. This has since produced our current impoverished view of education. At present, the schooling system is the echo of a darker past. It is not so much broken as obsolete. There is an old maxim about the pointlessness of training soldiers to fight the last war. It conjures up the picture of fighting the dangers of cyberspace from horseback with sabres. And so modern parents find that, far from strengthening childrens’ minds, schools are infantilizing them, leading to a childhood extending well into adulthood. Clearly, test-taking is not a character-building skill. Progressive educators regularly face indignation from those protecting the status quo. Yet even more frequently, the authors find the desire to break through the barriers of a stagnant system to create something new. Fortunately, a growing number of schools are experimenting with different curriculums. Nancy Steinhauer explains that Ottawa contains more schools with programs of choice than anywhere else in Canada. She has also been involved with “Measuring What Matters,” an initiative designed to help define the skills and competencies needed in the 21st century. These include social and emotional skills, citizenship values, and even digital citizenship; the latter is an under-appreciated yet increasingly vital part of education. Pushing the Limits offers hope for the future of public schooling. Authors Kelly Gallagher-Mackay and Nancy Steinhauer step onto the ideological battlefield to bravely face the entrenched status quo. Their book provides optimism and guidance for those looking to join the steep fight ahead. The battle for education cannot be left to a policy of wait and see. It is a war for the future itself. From a previous battleground we find a sentiment resounding deeply from Abraham Lincoln. “The dogmas of the quiet past are inadequate to the stormy present. . . As our case is new, so we must think anew.” That's pretty much the heart of it. The line-up was not the usual suspects. Three of Canada’s top murder mystery authors sat before the crowd, ready for interrogation: Ron Corbett, Barbara Fradkin, and Amy Stuart. The accusation? Writing suspenseful, thrilling, violent mysteries. The point of the inquiry? How can such lovely, seemingly normal people, write such grisly heinous crimes? 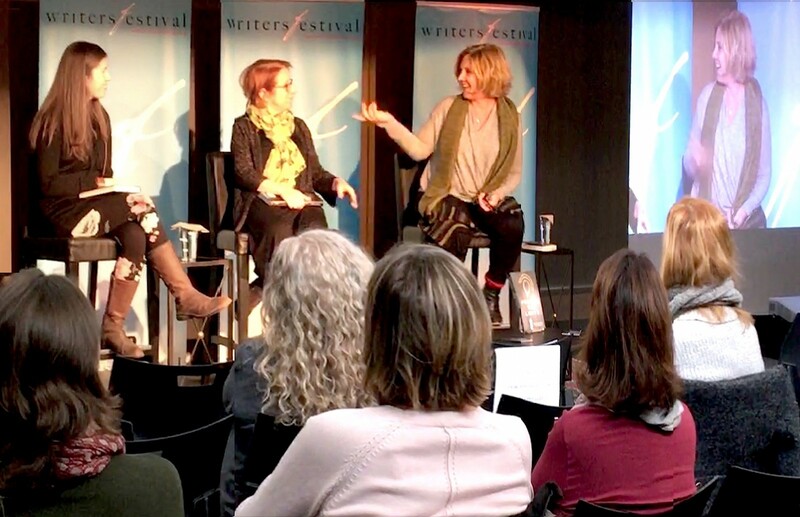 In hot pursuit of the craft of writing, participants in the Ottawa International Writers Festival embarked on an intriguing investigation into the chilling secrets behind the minds which generate Canada’s best mystery fiction. With Daniel Bezalel Richardsen as lead detective, a night of sleuthing commenced. Each author read a brief passage from their work and then joined together on stage as Richardsen unearthed the most devious and foolhardy tricks of their trade. Case closed. Guilty as charged.